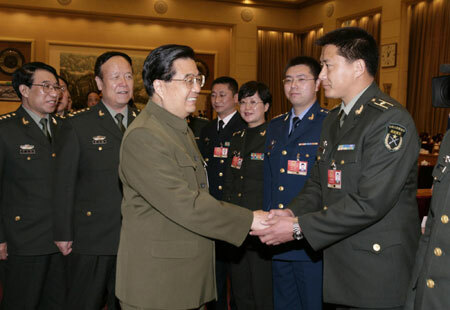 BEIJING -- Chinese President Hu Jintao on Wednesday called on the armed forces to provide mighty support for national interests and social stability. The People's Liberation Army (PLA) and the armed police shall energetically speed up the modernization of defense, resolutely safeguard the country's sovereignty, security and territorial integrity, and provide a mighty support for national interests and social stability, Hu said. Hu, also chairman of the Central Military Commission, made the remarks at a plenary meeting of PLA deputies to the National People's Congress (NPC), the top legislative body. He stressed the Party's leadership in the armed forces and called for the scientific development of defense and armed forces. The armed forces shall voluntarily serve the overall work of the Party and the country, and contribute to economic development and social stability, he added. He also told local Party committees and governments to support the development of defense and armed forces.